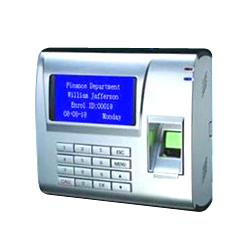 Sure Joy Technology Industrial Co., Ltd.
T&A, Access Control, Safes, Card Locks. 1. Fingerprint capacity: 3000 (around 900-1400 users). 3. Communication: RS232, RS485, TCP/IP. 4. Identificaiton speed: less 1.1s. 5. Wiegand: wiegand in/wingand out. 6. FAR: less than 0.0001%. 7. FRR: less than 1%. 8. Operation temperature: -10 to +65 degree. 11. Software function: HR/TA/salary/graph support. 1. Size(mm): 165(L) x 150(W) x 52(H). 2. Color: black or white (silver).